20 x 24 inch signed silver gelatin print. 24 x 20 inch signed silver gelatin print. This exhibition pairs two outstanding African photographers of different generations. 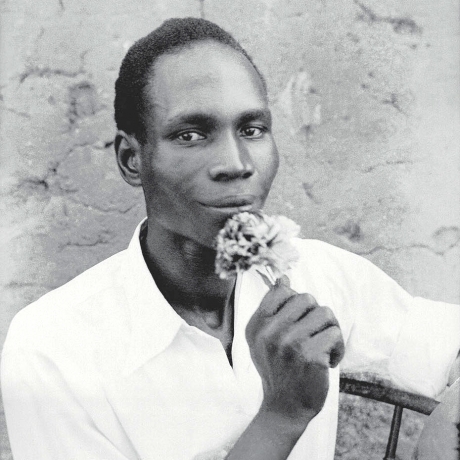 The photographers - Seydou Keita and Lolo Veleko - are linked both by the control evident in their work and the pleasure they take in observing their subject's personal style. Lolo Veleko, a 29 year old South African, came to attention in ICP's 2006 exhibition "Snap Judgments" - a show of contemporary African photography. In Veleko's ongoing series "Beauty is in the Eye of the Beholder" her photographs capture the street fashion of today's Johannesburg youth in small but vibrant full length color portraits. Veleko's portraits, continuing and updating Keita's tradition, show her subjects to be highly individualized and independent and suggest an implicit collaboration between artist and sitter. There is nothing haphazard in the choices of dress or pose or in the execution of the photographs. Together Keita and Veleko present a vivid counterpoint to the traditional western photographic depiction of Africans and a reminder of the freshness and quality of work coming entirely from the African cultural tradition. * While there have been questions about the legitimacy of various Keita prints, the prints in this exhibition come from the collection of Philippe Salaun who printed for Keita from 1994 to 2001. All prints are signed by Keita on the front and bear Salaun's stamp and date of printing on the reverse.